Almost a month ago I wrote about a trip that I took to the USS Hornet that is permanently birthed at the former Alameda Naval Air Station. One of the great things about visiting that ship is that there is quite a bit of space where you can freely wander and get up close and personal with exhibits on board. I had been to a small airshow at our local airport and seen mostly military helicopters up close, but while this particular plane had a rope around it, most did not and you could get right next to them. The yellow color on this T-28B Trojan trainer really grabbed my attention as it stood out against the rather neutral colors of everything else around me in there. Pictured in the background is a TBM-3E Avenger, a WWII era torpedo bomber. Related Photos: O Captain! My Captain! O Captain! My Captain! El Capitan Emerges from the Shadows Lots of pics, but none to post! Azeneth and Willie – Honeymoon in San Francisco Drop Everything! 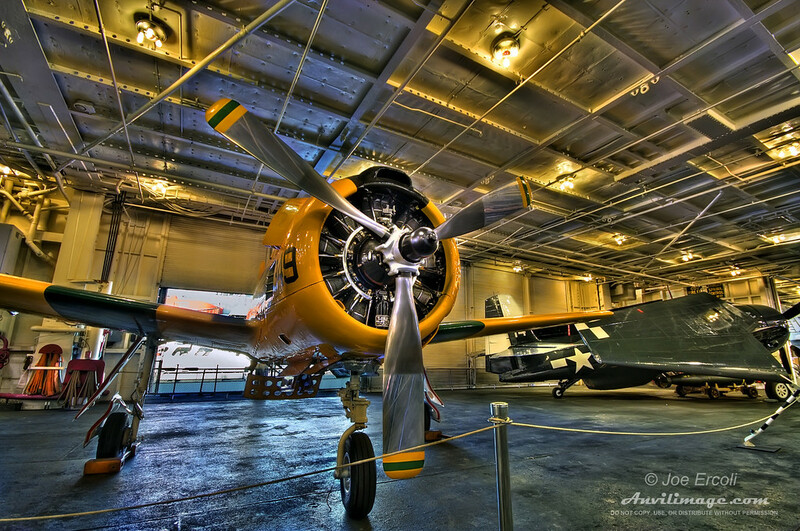 This entry was posted on Thursday, February 19th, 2009 at 2:57 am	and is filed under Blog, Photos and tagged with air force, airplane, HDR, landmark, military, navy, plane, trainer, USS Hornet, WWII. You can follow any responses to this entry through the RSS 2.0 feed.